Nissan elgrand E51 facia fits over radio and heater control. In BLACK. Good condition. This fascia kit allows the installation of a double din head unit into a non double din size aperture. 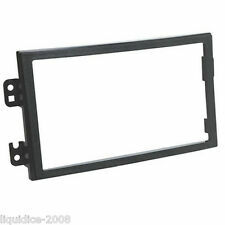 Nissan Fascia Plate (Black) For Double DIN Installation. Nissan Pixo 2009 - 2013. 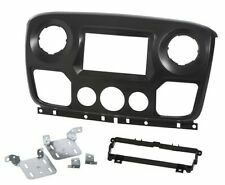 CT24NS06 Car Stereo Fascia Fitting Kit For Nissan. The kit includes fascia, and wiring harnes adaptor. Single Din Fascia Adaptor (Silver). Aerial Adaptor. Fitting Kit Includes. Maco Rail Inline Espags 20mm/22mm Backset Gear Gr.1/Gr.2/Gr.3/Gr.4/Gr.5 and Gr.6 odd123(314). Shaw - John Carr - Jeld Wen - Window Handle Key Only phil39ot(516). Union Monarch L22180 Aluminium Door Lock Centre Case 30.5mm Backset 48mm PZ oldflattop(46). Vauxhall Movano and Nissan NV400 vans from 2010 to 2017. directly to the sides of the new radio and the fascia panel. This replaces the need for a fitting cage and gives a flush professional appearance to the installation. 2013 Nissan Navara MK2 FL (D40) Automatic Gear Stick Surround. NISSAN QASHQAI J10 FRONT RIGHT. REMOVED FROM 10 REG QASHQAI 1.5 DCI. INTERIOR DOOR WING MIRROR TRIM. so you can make a claim. GOOD CONDITION SOLD AS PICTURED. OTHERWISE GOOD CONDITION. PRE-USED ITEM IN GOOD WORKING ORDER. This is a genuine Nissan Pulsar N13 4s 5door Hatchback Rear Left Hand Kicking Plate. International, E b a y. Try and find a part number on the existing part. Failing that. I advise you to check that this is the correct part for your particular vehicle. Qashqai N-Connecta DCI (MK2 PRE-FACELIFT J11) (ABS). 12v Plug Socket. About MGV Auto Spares Ltd. Our Opening Hours are:-. Engine Size. CASH ON COLLECTION. Vehicle Photographs & Guide. Nissan Datsun Micra K10, Radio facia surround, new genuine part. 28040-03B00. New K10 radio facia plate, rare new genuine part. Nearside Side Dashboard Trim. Qashqai 2 N-Tec DCI (MK1 FACELIFT (J10)) (ABS). Exterior Colour Code. Interior Trim Code. The table below contains further information. Air Conditioning. Internal Part Reference Number. Qashqai Tekna DCI (MK1 Pre-Facelift (J10)) (ABS). Exterior Colour Code. Internal Part Reference Number. Interior Trim Code. Air Conditioning. The table below contains further information. This item is a used vehicle part and as such may have signs of general wear/handling. Qashqai Acenta DCI (MK1 PRE-FACELIFT (J10)) (ABS). Exterior Colour Code. Interior Trim Code. Electric Front & Rear Windows, Electric Folding Door/Wing Mirrors. Air Conditioning. The table below contains further information. Must be used with patch lead to suit make of head unit being fitted. we need to know what head unit you will be fitted. This fascia kit allows the installation of a double din head unit into a non double din size aperture. 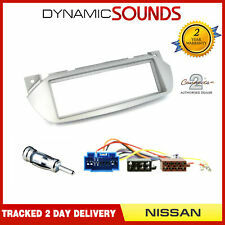 Nissan Fascia Plate (Silver) For Single & Double Din Installation. Retains Full Functionality Of The HVAC System. 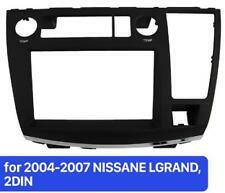 For Nissan Car Stereo Radio Single Din Fascia Panel Plate. This panel is designed to fit single din units. If the panel is supplied with side brackets then the stereo cage is not used to fit the radio. About Nissan Parts. Wing Mirrors & Covers. 1.3 We will provide the requisite information when we confirm that we have received your order. Update the interior styling of your Nissan Leaf with this blue centre console. Gearbox code. LUGGAGE PLATE. RHD BOOT TRIM PANEL INNER. NISSAN LEAF. Engine by NISSAN. Paint code. Wheel size. We are also not responsible for installation errors, labor expenses, or any other expenses that may occur. LUGGAGE FINISHER. Gearbox code. NISSAN LEAF. RHD BOOT TRIM PANEL. Engine by NISSAN. Wheel size. We are also not responsible for installation errors, labor expenses, or any other expenses that may occur. Nearside Interior Electric Door/Wing Mirror Trim. Qashqai Visia DCI (MK1 Pre-Facelift (J10)) (ABS). Electric Front & Rear Windows, Electric Heated Door/Wing Mirrors. Exterior Colour Code. Internal Part Reference Number. Micra Acenta (MK3 FL Facelift (K12) (ABS). Exterior Colour Code. Interior Trim Code. Air Conditioning. The table below contains further information. Internal Part Reference Number. This item is a used vehicle part and as such may have signs of general wear/handling. ). Qashqai DCI Visia (MK2 (J11) Pre-Facelift) (ABS). Centre Console/Electric Handbrake Switch Trim. Exterior Colour Code. Interior Trim Code. This item is a used vehicle part and as such may have signs of general wear/handling. Nearside Front Dashboard Air Vent. Qashqai Tekna DIG-T (MK2 (J11) Pre-Facelift) (ABS). Exterior Colour Code. Interior Trim Code. Air Conditioning. The table below contains further information. This item is a used vehicle part and as such may have signs of general wear/handling. Removed from the car below but may fit other Mk3 Models/Years. Wing Mirror Type. Screws, nuts and bolts are also classed as a free gift if included. Option can be added at checkout. Paint Colour. All parts are used but fully tested and in full working order before removal. NISSAN MICRA MK3 K12 02-10 Front Passenger Nearside Dash Side End Trim Panel. Removed from the car below but may fit other Mk3 Models/Years. All parts are used but fully tested and in full working order before removal. Offside Front A-Pillar Trim. Juke N-Tec (MK1 (F15)) (ABS). Exterior Colour Code. Electric Front & Rear Windows, Electric Door/Wing Mirrors. The table below contains further information. Interior Trim Code. Qashqai N-Connecta DCI (MK2 PRE-FACELIFT J11) (ABS). Centre Front Air Vents. Electric Front & Rear Windows, Electric Power Folding Door/Wing Mirrors. Exterior Colour Code. Interior Trim Code. Air Conditioning. Juke Acenta (MK1 Facelift (F15)) (ABS). Interior Boot Trim. Exterior Colour Code. Internal Part Reference Number. Interior Trim Code. Air Conditioning. The table below contains further information. This item is a used vehicle part and as such may have signs of general wear/handling. Gearstick Surround Trim. Qashqai N-Connecta DCI (MK2 PRE-FACELIFT J11) (ABS). Exterior Colour Code. Interior Trim Code. The table below contains further information. Internal Part Reference Number. This item is a used vehicle part and as such may have signs of general wear/handling. Offside Rear Interior Door Trim. Qashqai Acenta DCI (MK1 (J10)) (ABS). Internal Part Reference Number. Exterior Colour Code. Interior Trim Code. Electric Front & Rear Windows, Electric Heated Power Folding Door/Wing Mirrors. Gearstick Surround Trim. Qashqai DCI Tekna (MK2 (J11)) (ABS). Exterior Colour Code. Interior Trim Code. The table below contains further information. Internal Part Reference Number. This item is a used vehicle part and as such may have signs of general wear/handling. Steering Cowel Surround Trim. Juke Acenta (MK1 Facelift (F15)) (ABS). Exterior Colour Code. Interior Trim Code. Air Conditioning. The table below contains further information. Internal Part Reference Number. Qashqai Tekna DIG-T (MK2 (J11) Pre-Facelift) (ABS). Interior Tailgate Trim. Exterior Colour Code. Internal Part Reference Number. Interior Trim Code. Air Conditioning. The table below contains further information. Qashqai Acenta DCI (MK1 FACELIFT (J10)) (ABS). Dashboard Switch Trim. Exterior Colour Code. Interior Trim Code. Manual 6 Speed. This item is a used vehicle part and as such may have signs of general wear/handling. Nearside Front Dashboard Air Vent. Qashqai 2 N-Tec DCI (MK1 FACELIFT (J10)) (ABS). Exterior Colour Code. Interior Trim Code. Air Conditioning. The table below contains further information. This item is a used vehicle part and as such may have signs of general wear/handling. Qashqai 2 N-Tec DCI (MK1 FACELIFT (J10)) (ABS). Exterior Colour Code. Internal Part Reference Number. Interior Trim Code. Air Conditioning. The table below contains further information. This item is a used vehicle part and as such may have signs of general wear/handling. Qashqai DCI Tekna (MK2 (J11)) (ABS). Offside Front Dashboard Trim. Exterior Colour Code. Electric Front & Rear Windows, Electric Door/Wing Mirrors. Interior Trim Code. Manual 6 Speed. This item is a used vehicle part and as such may have signs of general wear/handling. Qashqai N-Connecta DCI (MK2 PRE-FACELIFT J11) (ABS). Start Stop Switch Trim. Exterior Colour Code. Interior Trim Code. This item is a used vehicle part and as such may have signs of general wear/handling. Interior Fusebox Cover. Qashqai Acenta (MK1 Pre-Facelift (J10)) (ABS). Internal Part Reference Number. Interior Trim Code. Exterior Colour Code. Air Conditioning. The table below contains further information. Gearstick Surround Trim. Qashqai Tekna DIG-T (MK2 (J11) Pre-Facelift) (ABS). Exterior Colour Code. Interior Trim Code. The table below contains further information. Internal Part Reference Number. This item is a used vehicle part and as such may have signs of general wear/handling.